Push the lock button and the SwingBlade changes from a drop point skinner to the ultimate gutting blade to open game like a zipper. 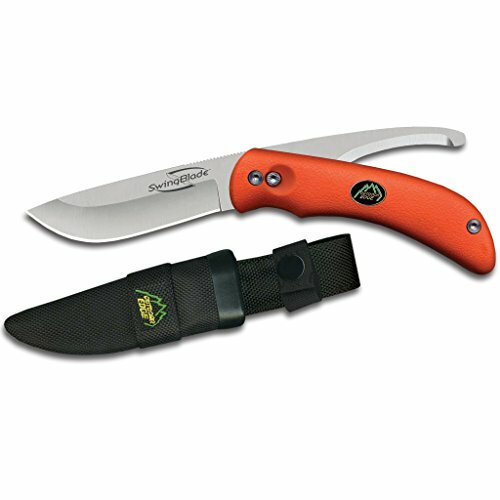 Guides and professional hunters around the world prefer this Outdoor Edge signature gutting blade because it cuts underneath the skin without cutting hair, and the blunt tip prevents punctured internal organs that can spoil fresh game meat. The 3.6 inch Japanese AUS8 blade is precisely heat treated and hand finished shaving sharp for superior edge retention and performance. The rubberized TPR handle ensures a non slip grip, even when wet, and is ergonomically shaped to eliminate fatigue during long use. Available in black, blaze orange or hot pink, and as a knife and saw combo set (SwingBlade Pak). The blaze orange handle is easy to spot on the ground, saving valuable time in the field while preventing loss. The SwingBlade comes complete with a nylon belt sheath.